UCR is located in Riverside, California—an hour’s drive from Los Angeles, Hollywood, Disneyland, mountain resorts, and famous beaches. Riverside is a multicultural hub nationally ranked for entertainment, diversity, and recreation. It’s also among the top 10 “Coolest Cities” (Forbes) and the top 10 “Fastest-Growing Economies” in the United States (US Bureau of Labor Statistics). Students enjoy the liveliness of Riverside’s centralized location and UCR’s quiet park-like setting. 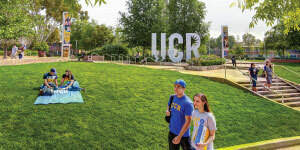 Take a tour and see for yourself why UCR is right where you want to be! UC Riverside prepares its students for an increasingly interconnected international community and global marketplace. 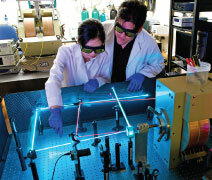 Ranked among the nation’s finest universities by U.S. News & World Report and among the world’s top universities by Times Higher Education, the University of California, Riverside is constantly conducting necessary research, heightening its reputation, and increasing its number of new state-of-the-art facilities. Enjoy hands-on experience with undergraduate research, as UCR is one of the few universities to offer faculty-led research opportunities to all undergrads! We are the seventh public research university in the nation to produce important research while extending social opportunity to students from underprivileged backgrounds (Brookings Institute, 2017). Students get a competitive edge with first-year and transfer student success programs, full-service career counseling, internships, 100+ study abroad opportunities, and more. The #1 university in the nation based on the White House’s proposed college ranking system (Time magazine) and a top “best value” school (U.S. News & World Report), UC Riverside also ranks seventh in student diversity (U.S. News & World Report), second in contributing to the public good, and first in the nation in community service hours (Washington Monthly)! Indications of growth are visibleeverywhere on campus. New buildings and research laboratories include genomics, psychology, and materials science and engineering as well as a state-of-the-art student recreation center and health and wellness events. Whether you have a passion for hiking, shopping, dining, or simply taking a stroll downtown, UC Riverside has a venue for you. Located in the heart of sunny Southern California and just a short drive from Hollywood, Disneyland, snow-capped mountains, scenic deserts, and legendary beaches, Riverside thrives with artistic energy thanks to the beautiful Fox Performing Arts Center, featuring iconic acts; the historic Mission Inn, visited by 10 US presidents; and the UCR ARTSblock, a cultural complex composed of three art institutions. UCR’s International Students and Scholars Office assists international students in successfully navigating University, state, and federal procedures and helps students adjust to living and learning in the United States. On-campus concerts have brought headliners such as Tyga, Capital Cities, Kendrick Lamar, AWOLNATION, and Nas to campus. With more than 500 student organizations to join, students have plenty of opportunities to explore their interests outside the classroom. Residence halls include computer labs, high-speed internet, on-site convenience stores, academic support, and many social activities. Year-round housing options are available as well. On-campus restaurants and retail dining options offer a wide variety of healthy and delicious food from many different cultures. UC Riverside’s world-class faculty include over 900 prominent scholars and researchers, and over 98% have earned a PhD or equivalent degree. The 2005 Nobel Prize winner in Chemistry, Richard R. Schrock, recently joined the faculty as a Distinguished Professor. Other faculty honors and awards include 48 Fulbright Fellows, 19 Guggenheim Fellows, and 49 National Endowment for the Humanities Fellows. UCR is included in The Princeton Review’s 2017 listing of the “Top 50 Green Colleges,” recognizing schools that share superb sustainability practices, a strong foundation in sustainability education, and a healthy quality of life for students on campus. This distinction is due in part to our groundbreaking research into battery technology and solar-power farms and a student organization called Sustainable UCR. The first floor of Winston Chung Hall in UCR’s Bourns College of Engineering is powered by one of the largest storage battery installations at a university in the world,made possible by researchers at the College of Engineering-Center for Environmental Research and Technology (CE-CERT). Other important ongoing research ranges from engine technology that allows cars to run on a mix of hydrogen and natural gas to a clean method of efficiently turning waste materials into a sulfur-free diesel fuel. 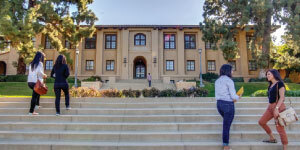 UC Riverside also offers the largest undergraduate Business Administration program in the University of California system and the first new public medical school in California in four decades. The UC Riverside School of Medicine seeks to improve the health of medically underserved populations. UC Riverside students are changing the world. Be a part of it.